We think this can be misleading. To a large extent, the look of the end product and it's overal ambience depends on what is actually hand done. So how is our Oak Furniture and Architectural Joinery made? We use reclaimed old oak (usually 150 to 500 years old) which requires time and great care in selecting. Cut to size using hand-held tools (we don't use re-saws), so no two pieces are identical, perfectly straight or of uniform dimensions. Finished 'by eye' using hand-tools. The 'relaxed' effect we achieve is subtle, not contrived, just like an early piece of furniture or an old timber framed house. Wherever possible we retain the original pit sawn surfaces or reproduce them in the most convincing way. All our carving is both set out and executed by hand. Individually fitted mortise and tenon joints using the drawer bored and pegged method, with hand-made tapered oak pegs, just as it was done centuries ago. Because of their inherent irregularities, panels are also individually hand planed to fit. Where they are used, we hand-cut dovetail joints. Arguably the most important aspect, that needs time and finesse to get right. The ageing is very carefully and thoughtfully administered, so as to accurately reflect centuries of genuine wear and tear. The colouring is hand applied using techniques and formulae developed over decades and unknown to anyone else. Final finishing is also hand applied using traditional beeswax and carnauba wax. We probably spend more time on this aspect than anyone else and is reflected in the quality of colour, clarity and patination achieved. Overall, a very labour intensive way of doing things and, with higher material costs as well, we normally work on two to three times the manufacturing costs of a 'hand-finished reproduction'. However, the rarity of this level of oak furniture making today today (we're not aware of anyone else that works to such detail), produces an end product which is not really reproduction at all. More appropriately, it is regarded by our clients who demand this depth of authenticity, to be the very best alternative to a none existent, unsuitable or financially out-of-reach original. Indeed, from a serviseability and practicality point of view, our replica pieces are often seen to be a better alternative. Lead times are normally between 20-50 weeks. English/European character grade oak cut and prepared using modern machines and then hand-planed, spoke shaved or hand-scraped. Table tops are usually spoke shaved and hand scraped straight from sawn oak. Cut by passing through a spindle moulder or router. Machine cut mortises and tenons (they're hidden when assembled), hand cut dovetails (they show when assembled) and all put together by hand...of course! Hand aged, hand coloured and hand finished. Early Oak Reproductions. 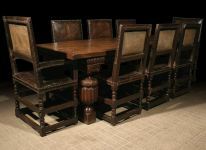 They have one of the countries largest ranges of 'top end' reproduction furniture... still handmade and outstanding value for money.